The original Chromecast was a cheap and simple way to get streaming content to your dumb TV. It looked like a steroid-ripened USB stick and was packed with, at the time, innovative streaming features. As is inevitable in the fast-paced world of technology, an update has come along and brought with it a sleeker look, a simpler setup but it slightly stumbles when it comes to some features. 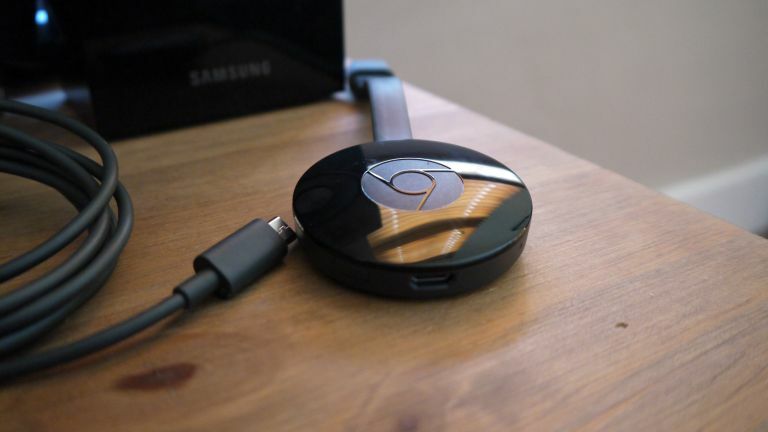 The new Chromecast has shed its USB look for something a bit more dapper. It's disc shaped and has been given a funky new logo that looks... well, let's just say Google should expect a call from Dr Dre as it is very reminiscent of the Beats headphone emblem. Attached to the shiny new colourful disc is a flat rubber cable which makes putting the thing into your television a whole lot easier. While the original Chromecast was small, it was also rigid, which meant that it didn't suit some TV setups. A bendable rubber cable means that this device should suit any setup, as does the magnetised back which allows you to stick it to any metal-backed TV. The added colour is a bonus, too. Even though the model we reviewed was a gloss black, there's a number of other colours, including red and yellow, to spice up your streaming. Given the thing does go on the back of your TV, though, it's unlikely you will get a glimpse of the Chromecast. So, why the new design? Although this hasn't been confirmed by Google, it's probably not just an aesthetic thing: the device holds a trio of antennas to make sure it has the best possible hold of your WiFi signal which may have added to the extra bulk. I never actually had any issues setting up the original Chromecast, so didn't really see much difference in the setup, but anyone that had issues in the past should be happy with 802.11ac connectivity. This being Google, however, you don't actually need to know about the complex way the Chromecast latches on to your WiFi, all you see when you plug it in is a waiting screen and a prompt to download the Chromecast app. Setting the device up is that simple. You download the app, pair the Chromecast with your Wi-Fi, wait for an update to install - well, we had to - then watch a glossy minute-long video about how Chromecasting is awesome. One this indoctrinate is complete, you are ready to go. It is at this point that the main device hands the baton over to the app. This is because there is a no remote in the box - other than the Chromecast, all you get is a mains adaptor - so you use the app on either an Android or iOS device. The app has been completely overhauled for the new Chromecast. Don't panic if you have the old Google streamers, either, as you will be able to use this app as well. The app is split into three categories: What's On, Devices and Get Apps. The What's On section allows you to see what apps you have on your device that are compatible with Chromecast. Lucky for us, there are quite a few. The likes of BBC iPlayer, Netflix and Spotify are all Chromecast ready, as are the glut of Google apps. This means that if you have Google Play Music and YouTube you will be able to 'push' the media to your Chromecast. For those who don't quite know what that means, the app is essentially mirrored on to your television screen, thanks to the Chromecast. To make sure it goes to the big screen, you just have to find the square Chromecast logo and click on this. In our tests, most apps took just seconds to appear on the screen. There was minimal buffering, too - even when watching Full HD content. Some things were quicker still, thanks to Google's Fast Play functionality - here it second guesses the sort of thing you will want to be watching and pre-buffers it for you. This works best when you are binge-watching TV shows. Those expecting the device to be compatible with 4K will be disappointed, though. If you are looking for that, then maybe check out the Amazon Fire TV with 4K or the new Nvidia Shield. The Devices section is self explanatory. It's where you can see all of the Chromecasts available in your home. The Chromecast is cheap, so Google is expecting you to load up all your TVs with the tech. Here you can pause what is on the screen, control the volume and can stop the Chromecast from playing if you needed to. Get Apps takes you to a 'special place' in whatever appstore you are in and allows you to search for all compatible apps with the Chromecast. The apps are mainly video, audio and a smattering of games. Google has also added universal search, which allows you to search for a song or a movie and it will come up and tell you the app you can find it on. This can be done by voice or text but, surprisingly as this is Google, the search wasn't bulletproof. For the most part it worked well finding the things we wanted but there were the occasional lack of content when you know it is there. This is something that is only going to improve with updates. Google has once again proved that it has the smarts to make streaming work. The new design is fun but functional, the new app more responsive and, for the most part, a joy to use. But the best thing about the Chromecast is the price - at a snip under £30, it is one of the cheapest ways to stream and comes with all the Google gloss you could want. Apart from a few search niggles and the occasional confusion the app has when you leave video paused for a long amount of time, the new Chromecast is superb. Is Netflix still the king of streaming?